Do you want to improve your smile, prevent cavities, or need dentures, but want everything done comfortably? Do you know what questions to ask and what procedures are available? With the advancements in technology, you can turn any smile into a 5 Star Smile in just a few short visits. And, it can be done in a comfortable, anxiety free environment. It is important to know what you want to accomplish with your smile, and what your options are. We have compiled and answered many of the most common questions people have about going to the dentist along with some recommendations on how to find anxiety and pain-free dental care. We hope that after reading this article you’ll be a lot more knowledgeable and confident when going into Larrondo Dentistry, asking questions, and scheduling an appointment. How Can Dentistry Be Comfortable? Painful needle injections, the high pitched sound of dental drills, and getting anesthesia that doesn’t allow you to eat or talk normally can make even the most rational person not want to go to the dentist, and avoid it all together! An End to the Dental Drill! Just the sound of a dental drill is likely to make one shudder. Now a new technology called air abrasion may one day eliminated drills forever. Air abrasion works on teeth much like a sand blaster works on a building. Tiny particles of aluminum oxide are blasted in a stream of water to remove the decayed debris and ruined enamel of cavities. This system is nearly painless and eliminates the need for needle numbing shots. The air abrasion system is more precise than conventional drills allowing Dr. Jorge E. Larrondo to save healthy enamel that surrounds the cavity. The thought of being stuck inside our mouths with a needle is discomforting. For centuries the needle has been the primary way for dentists to inject lidocaine and other anesthetics necessary for dental procedures. A new device called the DentiPatch may change this. The DentiPatch, a band-aid looking device, is applied by the dentist to the gums. Here lidocaine diffuses out of the patch and is delivered into the gum tissue. The DentiPatch can be used for most routine dental procedures. In cases where, delivery of anesthesia by a needle is necessary, the DentiPatch can first be applied to prevent the pain of the subsequent needle injection. A new needle anesthesia delivery system may also end painful dental visits. The pain patients experience from needle injections is caused not by the needle itself but by the rate at which the anesthesia is injected into the gums. 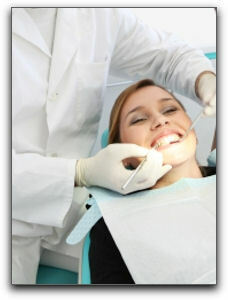 The slower and steadier the dentist is when he or she injects the anesthesia the less painful the injection. Most dentists, however, cannot inject the anesthesia slowly enough or at a steady enough rate to make discomfort a thing of the past. That is where the Magic Wand comes into play. This new device contains a microprocessor which monitors and controls the rate at which anesthesia enters the gum tissue making the injection virtually discomfort free. Most patients simply feel pressure rather than pain when the Magic Wand is used. With new technologies the pain and discomfort associated with dental visits may become a thing of the past. Now millions of people who fear going to the dentist may have a new reason to smile. The Patient Is In Control At All Times! One of the big things for having a comfortable and enjoyable experience is choosing a dentist who truly cares and is highly competent when using comfortable technology, because not all dentists are! In our office, if you feel any type of pain or discomfort you can just raise your left hand and know you will get more anesthetic. If you want to stop, if you want to take a break or anything just raise that left hand. It’s all about having a system in place that gives you, the patient, a sense of control. We want you to feel confident that if it does hurt, we are not going to keep going. And the most important thing for you to understand is that our dental staff and you, are partners, working together to get you the best results possible, in the most comfortable pain free way possible! If you have a tooth taken out or an emergency exam or a root canal, anything that might cause some discomfort afterwards – you deserve a personal follow-up call at the end of the day to see how you’re doing and if you need a prescription called in. When leaving after your procedure in our office, Dr. Larrondo will personally give you a card with a number to call and say “if you need anything give me a call and I’ll call you back within an hour or so depending on what I’m doing, even if you just have a question just call me”.